KeyMod vs M-LOK—What's the Difference? Home KeyMod vs M-LOK—What’s the Difference? KeyMod vs M-LOK—What’s the Difference? If you’re old enough to remember Blockbuster Video then you probably remember the HD vs Blu-Ray showdown. HD players played high-definition optical discs while, as you know, Blu-ray players play Blu-ray discs. The war between the two formats lasted from 2006 to 2008 and Blu-ray ultimately won out. A similar war is now being waged between these two rifle accessory rails. For the longest time, the picatinny rail system has been the gold standard for mounting AR-15 furniture. The system has served shooters well, especially when it comes to bolting spotting scopes and the like. That being said, the inclusion of picatinny rails on your handguard can result in undesirable bulkiness and can seriously weigh you down. This is a real headache for hunters who want to carry their rifles and rifle accessories on a long trek. 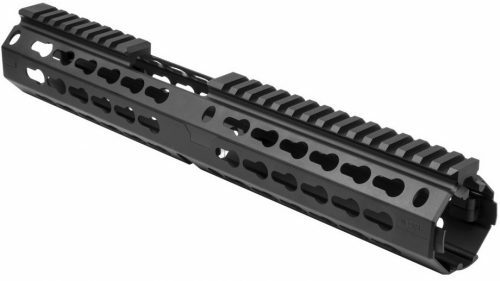 To solve this conundrum, low profile handguards enable the shooter to attach small sections of rail where they are necessary instead of weighing you down in arbitrary spots. This is all well and good, but now we can cut out the middle man and just place our accessories right on our handguards without a picatinny adapter. That’s where KeyMod and M-Lok come in. KeyMod is a fairly recent development from the people at VLTOR and Noveske who created it as a public domain design which allows all companies to manufacture KeyMod rails without having to pay royalties for the privilege. KeyMod-style handguards are impressively light and allow the user to directly attach KeyMod-compatible accessories to their rifle. A number of companies are now manufacturing KeyMod rifles and handguards along with accessories such as bipod adapters, flashlight mounts and more. Mission First Tactical sell KeyMod QD sling mounts that work with standard quick-detach sling swivels and Seekins Precision NOXs ™ offer an affordable KeyMod handguard with a one-piece freefloating design. KeyMod rails are comprise of a series of “keyholes” which allow the user to attach compatible accessories by lining up the lugs on the accessory with the circular part of the keyhole. All you do is slide it, tighten the screws and bam! You’re all set. There are pros and cons to both the KeyMod and M-Lok systems. With that in mind, here is an overview of what makes KeyMod great and where it’s a bit lacking. Magpul is one of the biggest names in firearms and firearm accessories. When they caught wind of the general KeyMod system idea, they wasted no time in producing their own variant. Lo, the M-LOK was born and it’s pretty badass. Not only is it easier on the eyes (it’s got an awesome design) but it’s also widely believed to be more durable than the polymer alternative. Instead of using keyholes, the M-LOK system relies on straight, elongated slats. M-LOK accessories’ attachment lugs can be attached at either the rear or front of the slots, giving the user some wiggle room. This modular locking accessory mounting system may sound quite attractive to many shooters, but some in the community are of the mind that Magpul’s innovation is a little late to the party with the argument being that far too many shooters are already married to the KeyMod that was able to render those heavy quadrail forends obsolete. Maybe they’re right or maybe they’re wrong. You be the judge. Here’s lookin’ at what makes this system worthwhile and what makes it kind of lackluster. Some avid shooters have called M-LOK “garbage” on gun forums while others have said that it’s more difficult to install than the KeyMod system. A friend of mine said that M-LOK chewed up the front and rear of the slot where his bipod mount clicks into metal claws, saying that the sharp edges bite into the interior of the M-LOK slats. While I haven’t had much experience with M-LOK personally, I can attest to the quality of KeyMod’s design. It’s never let me down and it’s been around long enough for me to have noticed any substantial deficiencies. It easily indexes accessories and those KeyMod accessories are incredible and diverse. BCM’s Vertical Grip Short features a tool-less attachment method which makes life a lot easier and other companies like Knight’s Armament offer barrier stops that provide that extra support you need when firing from improvised positions. Those are but a few of the many KeyMod-compatible accessories being mass-produced today. But the same can be said of M-LOK. Magpul has everything from polymer rail sections and aluminum rail sections to carbine-length handguards and hand stop kits. In summary, KeyMod seems to be the top contender for the number one spot in terms of picatinny rail system replacement. However, it really comes down to personal preference. Some shooters may want to go with M-LOK just for the look alone, but in my humble opinion you can’t go wrong with KeyMod. My advice: Do your homework and read consumer reviews/experiences before you settle on one or the other. One quick reminder – if you haven’t checked out our guide to the best ear protection for shooting please do. Staying safe on the range starts first by having the best gear available.